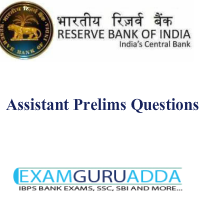 Dear Readers,we are presenting some of the questions asked in RBI Assistant Prelims exam-24th December 2016 of all shifts. 1. 7 21 5 23 ? 2. 6 7 16 51 208 ? 3. 15 22 32 46 65 ? 4. 9 10 18 27 91 ? Eight people M,N,O,P,Q,R,S, T seating in a row facing North. Three people seating between P and M. N is to the right of Q. As many people seating between P &amp; T, as many between T and S.
O is seating to the 2nd to the left of T. N is not on any of the extreme end. 1. One day a professor entered his classroom,and asked his students to prepare for a surprise test. They all waited anxiously at their desk for the exam to begin. 2. The professor handed out the exams with the text facing down, as usual. Once he had handed them all out, he asked the class to turn over the papers. 3. To everyones surprise, there were no questions- just a black dot in the center of the sheet of paper. 4. The professor seeing the expression on everyones faces, told them the following: “I want you to write about what you see there” the students, confussed, got started on the inexplicable task. 5. At the end of the class, the professor took all the papers, and started reading each one of them out loud, infront of all the students. All of them with no exception,defined the black dot, trying to explain its position in the center of the sheet. 6. After all had been read, the classroom silent, the professor started to explain: “Im not going to grade you on this, i just wanted to give you something to think about. no one wrote about the white part of the paper. everyone focused on the black dot – and the same happens in our lives. Eight person A, B ,C,D, E, F, G, H sitting around a circular table facing centre. D is third to the left of H. Two persons are between D and A.
F and G are facing each other. F is not sitting near D.
There are two persons between G and C. E and C are sitting together.